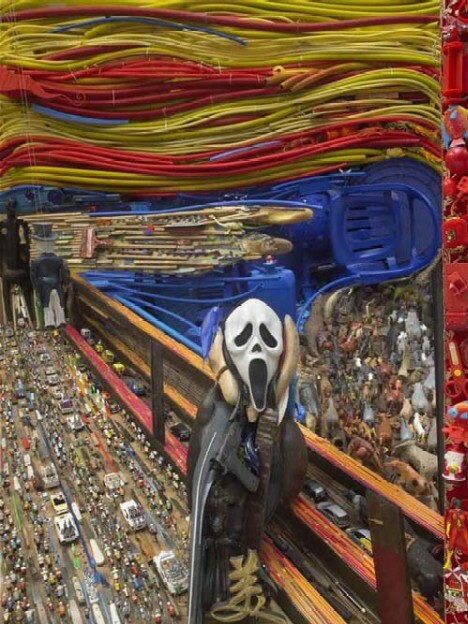 Bernard Pras has anamorphosis and he wants to give it to you… well, show it to you at least. Anamorphosis is the art of stacking objects on a piece of canvas or a photograph, and Pras is a master at creating sum-thing special from a whole lotta parts. 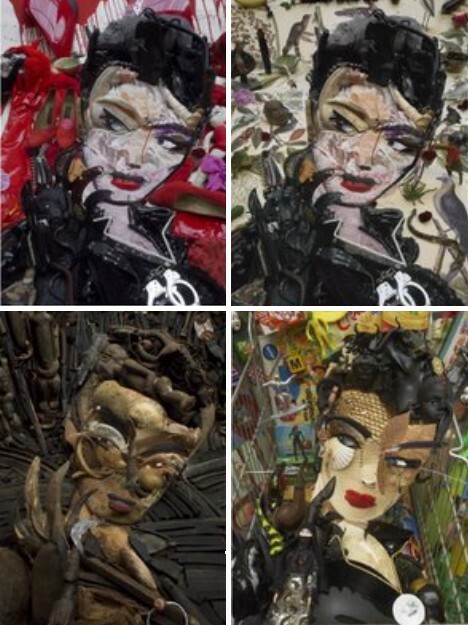 Bernard Pras (b. 1952) is a French artist whose bold re-imaginings of our artistic heritage force us to re-examine the way we look at visual art – which is itself a prism through which the artist channels a unique way of translating thoughts, emotions and ways of interpreting the world around us. Pras adds an extra dimension to familiar paintings, photos and images, often choosing materials that enhance certain aspects of his source material and allow the viewer to re-evaluate their original impressions of said source. 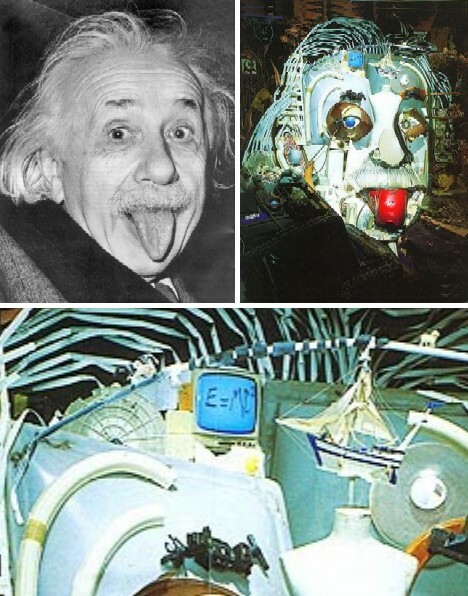 Pras is not the first assemblage artist – for that, you have to go back about 450 years to Milan, Italy, and a talented painter named Giuseppe Arcimboldo (1527-93). 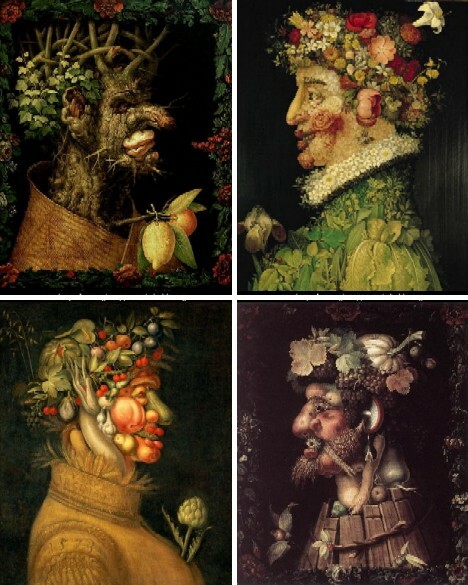 Arcimboldo, unusual for his time, painted portraits that seemed normal from a distance but upon approaching, revealed themselves to be skilfully composed congeries of objects. 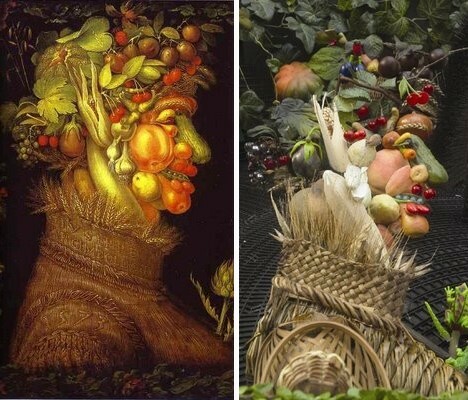 The most famous examples of his technique are four generic portraits from 1573 named for each of the four seasons and assembled from plants and other items corresponding to the time of the year. 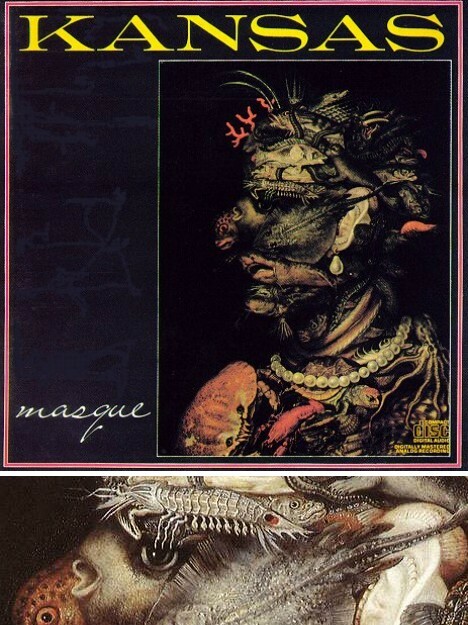 Arcimboldo was exposed to a new generation of admirers in the mid-1970s when his painting Water was used as the cover art for the album Masque, the third studio album by the rock group Kansas. 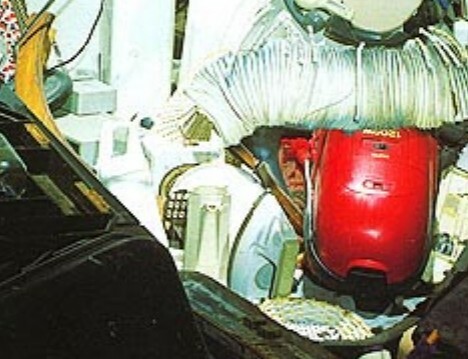 Just how much did Arcimboldo influence Pras? Only he can say, but it’s certain that Pras thought enough of Arcimboldo to produce a composition based on one of his iconic works. Above you’ll see Arcimboldo’s “Summer” on the left and Pras’ homage to its right. While Pras’ technique is most often described as anamorphosis, it can embody aspects of Assemblage Art and Collage. 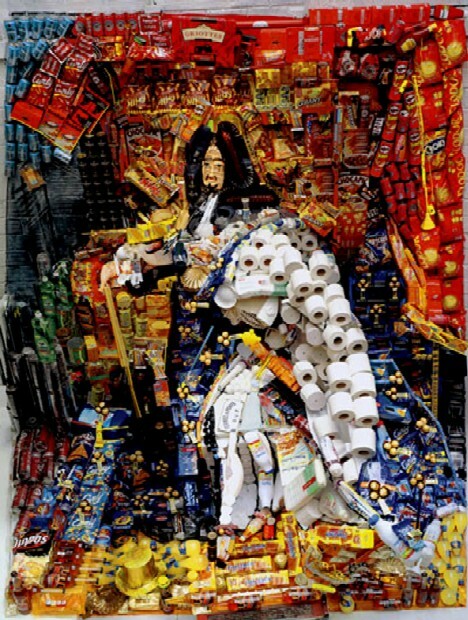 Pras also allows his sense of humor to shine out from his creations… was his use of toilet paper rolls in the above portrait of the French ruler Louis IV inspired by Royale brand bathroom tissue? 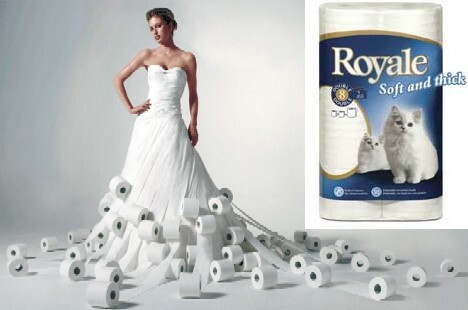 Was a Cashmere bathroom tissue ad inspired by Pras’ take on the Sun King? Mon dieu! Modern pop culture has proven to be a fertile field for Pras as he has gone to the well time and again in recent years, revisiting cultural icons such as Bruce Lee and the Catwoman from the Batman comics and films. Pras also takes advantage of his medium, often producing multiple takes on a single subject’s image source. Check out the four variations on Catwoman above – clockwise from upper left: Catwoman in Red, Catwoman, Catwoman-Africa, and Catwoman-Caddy. Even Che Guevara, thought to be an untouchable symbol of the 1960s counter-culture, undergoes the Pras treatment. 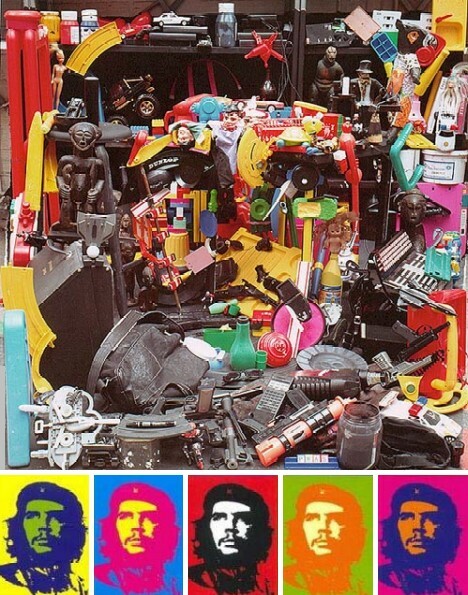 Note the artist’s use of toy guns and a red toy sheriff’s star in the Che collage, which evoke the violence of the communist revolutionary’s death as well as the innocence of the times in which many of his admirers lived. 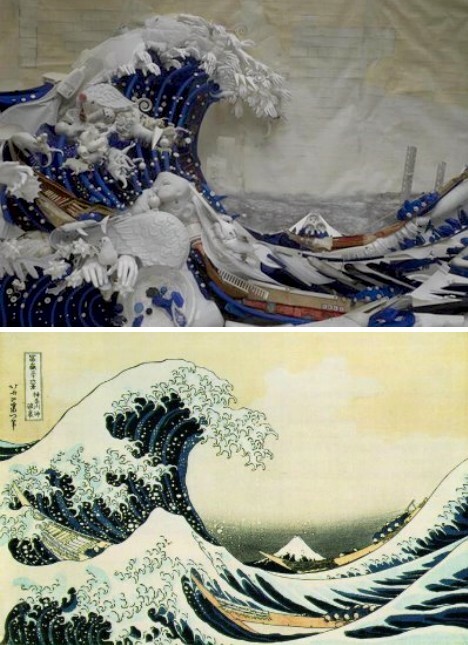 An older masterpiece like the Hiroshige woodblock print “The Breaking Wave Off Kanagawa”, usually referred to as The Great Wave, loses little if any of its immense visual impact when remade by Pras. That’s Pras’ version above top, Hiroshige’s original just below it. 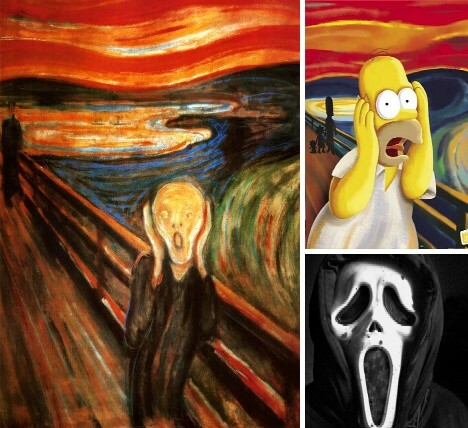 It doesn’t get much more iconic than the 19th century poster child for fear and anxiety, Edvard Munch’s “The Scream”. Pras’ choice of multicolored electrical wiring, transistor circuit boards and a .45 caliber revolver aimed up at a Halloween ghoul mask add an extra undercurrent of frisson to Munch’s original angst-laden imagery. 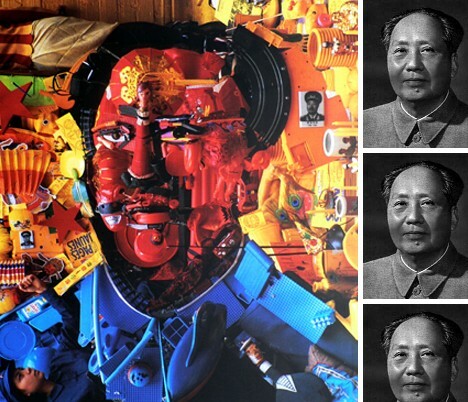 Mao and Marilyn – cultural opposites made equal in the eyes of Bernard Pras. 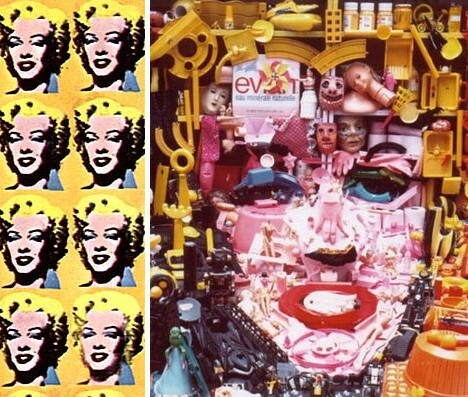 The source photos Pras bases his anamorphosic reproductions on also couldn’t be more different: the official Red Chinese photo portrait of Mao Zedong and Andy Warhol’s Marilyn Diptych, his 1962 tribute to Marilyn Monroe. 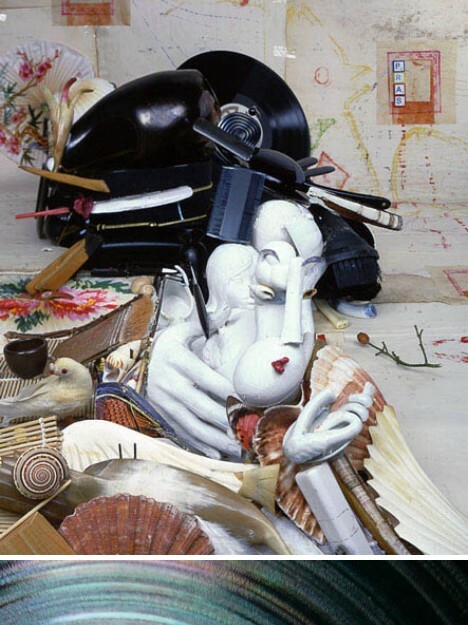 The work titled “Geisha” shows Pras at his most playful, employing Japanesque objects such as fans and seashells to enhance the atmosphere of his chosen subject: a classic Japanese geisha girl. One of the most startling features of the piece is the use of a vinyl phonograph record to act as a portion of the girl’s hair – the multiple parallel grooves of the deep black vinyl ape the textured lacquer hairdo. Everything’s relative, one must admit, even esteemed physicist Albert Einstein’s much publicized 1951 photo showing the scientist pranking pursuing paparazzi (yes, they were a scourge in the Fifties as well). Pras version, though still easily recognizable, appears to trade Einstein’s humorous intent for a darker, more ominous quality that reflects today’s more distressing geopolitical reality. 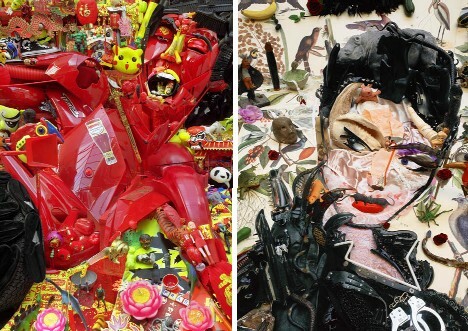 Some might say Bernard Pras’ works masterfully combine The Good, The Bad & The Ugly while others are sure he could sell them For A Few Dollars More and happily retire with A Fistful Of Dollars. 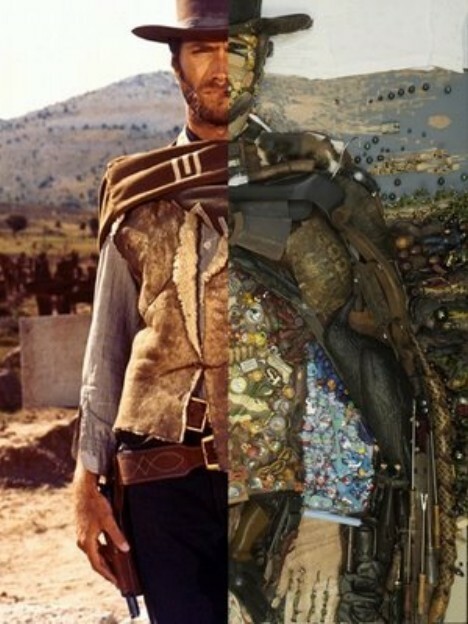 Enough Sergio Leone references then, and on to Pras’ take on everyone’s favorite Man With No Name, Clint Eastwood. 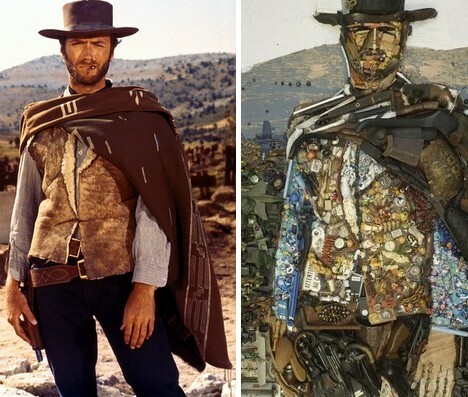 The top image performs a split-screen move on Pras’ composition and the original photo of Eastwood from his poncho-wearing, gunslinging days. 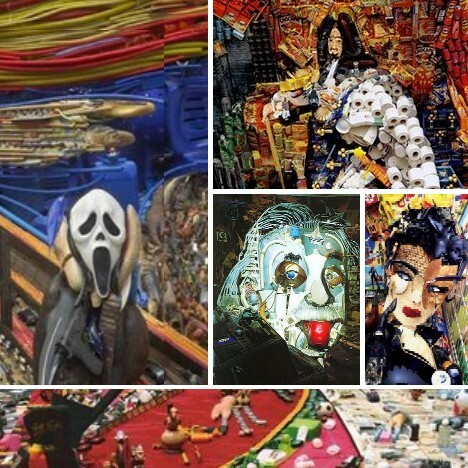 If “Blondie” could talk, what would he say to Bernard Pras? Maybe something like, “You see, in this world there’s two kinds of people, my friend: Those with loaded guns and those who create. You create."